What links the Investment Bank of Torabundo, www.myhotswaitress.com (yes, with an's, don't ask), an art heist, a novel called For the Love of a Clown, a six-year-old boy with the unfortunate name of Remington Steele, a lonely French banker, a tiny Pacific island, and a pest control business run by an ex-KGB agent? 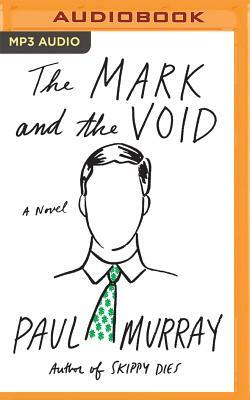 The Mark and the Void is Paul Murray's madcap new novel of institutional folly, following the success of his wildly original breakout hit, Skippy Dies. While marooned at his banking job in the bewilderingly damp and insular realm known as Ireland, Claude Martingale is approached by a down-on-his-luck author, Paul, looking for his next great subject. Claude finds that his life gets steadily more exciting under Paul's fictionalizing influence; he even falls in love with a beautiful waitress. But Paul's plan is not what it seems--and neither is Claude's employer, the Investment Bank of Torabundo, which swells through dodgy takeovers and derivatives trading until--well, you can probably guess how that shakes out. The Mark and the Void is the funniest novel ever written about the recent financial crisis and a stirring examination of the deceptions carried out in the names of art and commerce.